Finally, after a self-imposed ban on Indian food for a little while, I've finally decided to go back to the well. Yes, it is a pretty deep well at that. There are so many choices for Indian food out here along the Scott Road corridor. Don't get me wrong, I love Indian food and I was looking forward to eating it again. Joining me today were L-Pete and Pomegranate, which is a good thing since there would be more variety. Truth be told, I made sure there was variety... I'm so lucky people put up with my antics. Our destination today was Baba Sweets. If I am not mistakened, there is another location on 6th in Burnaby. couple of Beef Samosas as an appy, apparently not satisfied with his lunch combo. Personally, I thought it would be too much food; but hey, I'm not gonna stop him. He's ordering more food for me to try! I thought that the samosas were only an average value since there are many more other places around that charge less than $1.00 per item. The samosas themselves were good and bad. The nicely fried exterior was good, the gritty and dry beef filling was bad. I'd like to try the vegetarian on e next time. L-Pete went for the ever popular Butter Chicken. If you can see in the picture, the sauce is quite oily. 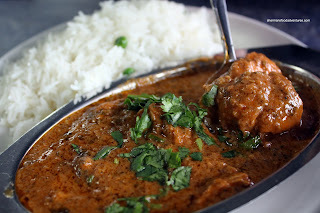 I realize that butter chicken requires quite a bit of ghee, but this was greasy, not smooth. Moreover, the flavour (to me at least) seemed slightly off. Rather than the rich sweetness (and slight tartness from the tomato) that is normally associated with butter chicken, this one was almost like a regular curry. 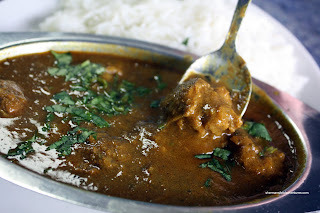 On the other hand, I did like my Lamb Curry. 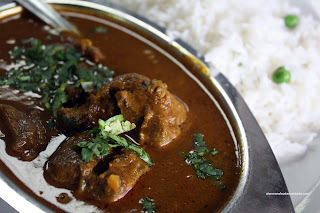 It had a decent amount of spice and tasted like a rich curry should (as in multi-dimensional flavours). Moreover, the lamb was tender and fairly plentiful. Pomegranate had the Chicken Curry and although it seemed like the same sauce, this one was a bit sweeter and less spicy. Either my taste buds were deceiving me or the different meat made a difference in the flavour. Believe it or not, the best part of the meal was the Naan. It was hot, soft and fluffy. The food here ain't gonna win any awards and to me it was a bit average. But, it was alright and a fairly good value when having the lunch special. 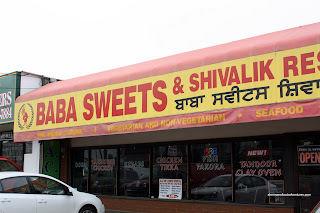 It would be beneficial for you to try the Baba Sweets in Burnaby. A quick check of the 'Urban Spoon' rating that you link to clearly shows which is the winner. I really like the vegetarian samosa from Baba Sweets in Burnaby, and their Butter Chicken is also very nice. The garlic naan goes very well with this curry. 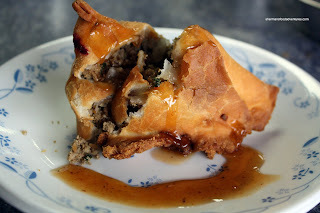 I do agree that the meat samosa is just a big ball of ground beef with minimal spicing. To be avoided. The vegetarian one is loaded with nice chunks of potato and peas, as well as interesting spices. tanuki86, I totally agree. I've heard the same things about the BBY location. As for the samosa, yah, i prefer the veg one too. Wow Sherman -- is there any ethnic hole-in-the where you HAVEN'T eaten? One of the things I do on my days off is go for long bike rides in the hinterlands of Vancouver, taking pix of places with no Photos on Urbanspoon. It's good exercise, shows me the zeitgeist of places outside my 'hood and gives me a chance to stop in at obscure eateries. So many times (like my recent jaunt down Scott Road) I'll be posting a pic of some nothing little resto in Nowheresville and I'll see "Hey -- lookathere! Sherman's Food Adventures has reviewed this joint." I appreciate that. I'm eternally curious about food, but I'll never have the time or the waistline to eat everywhere I want. All your reviews, even from years ago like this one, helps quench my inquisitiveness. @BC Thanks! LOL. Yah, there are many places I haven't tried yet! More food adventures to come!